Cold chain logistics are essential to the delivery of safe food, chemicals and pharmaceuticals. An efficient cold chain keeps these items within strict predefined temperature ranges in order to preserve their desired qualities. A lot is at stake in the cold chain: The Biopharma Cold Chain Sourcebook, prepared by Pharmaceutical Commerce, estimated the pharmaceutical-specific cold chain was a $13.4 billion market in 2017 and that the value of all products shipped through it climbed more than 10 percent from 2016. 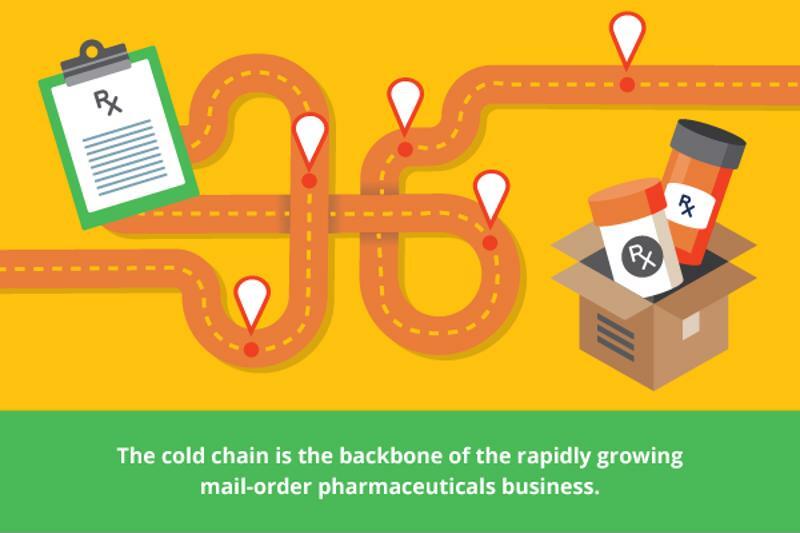 The cold chain is also the backbone of the rapidly growing mail-order pharmaceuticals business. More than one-fifth of all the $465 billion pharmacy sales in 2016 were via mail order, according to Morgan Stanley. Mergers and acquisitions, in part as responses to Amazon’s possible interest in pharmaceutical delivery, should divert even more resources into the industry’ mail-order infrastructure. Cold chain logistics must evolve and scale as demand for home-delivered medications increases. For starters, tight integration is paramount in cold chain logistics, since a high degree of control makes it easier to ensure that temperatures are always right. To that end, IoT sensors and applications can be installed in vehicles and at shipping facilities to create coherent tracking networks across supply chains. Their small sizes and compatibilities with multiple communications protocols (e.g., Bluetooth, Wi-Fi, ZigBee, cellular, etc.) make them ideal for a wide range of environments and requirements. For example, a logistics provider might implement a Near-Field Communications reader to wirelessly read the temperatures of shipments as they move from site to site or use cellular for movements across locations / sites while other technologies may be more suitable for in-facility monitoring. The IoT can provide much more precise, automated tracking to avoid these sorts of issues and ensure requirements are continuously met. Analytics gathered from embedded sensors can offer a clear picture of which shipments were best preserved across the cold chain, so that their setups could be replicated elsewhere. Current processes for cold chain logistics are highly manual and time-consuming. A typical workflow for temperature monitoring might involve setting up a logging device that uses a USB connection to download information about a shipment and then accompany it throughout the supply chain on a pallet. Someone then has to unpack all of these loggers – which can be large enough to take up valuable payload space – and connect them to PCs to read their contents. With IoT-enabled SCM, readings could be done much more efficiently in real-time, using radio-frequency identification (RFID) tags and GPS location data. Temperature controls themselves might be remotely accessible or at least consistently trackable, so that rerouting and other adjustments may be possible to save as many items as possible. The hardware components of the IoT – electronic trackers, readers, etc. – attract the most attention when discussing its impact on the cold chain, but software is where the real transformation might occur. Blockchain technology in particular shows great promise as a potential system of record to improve cold chain consistency and reliability. With a cold chain-specific blockchain, data from numerous IoT sensors could be collected and analyzed automatically. Plus, its integrity would be relatively high, since blockchains are difficult to tamper with and require compliance with their consensus mechanism when any updates are attempted. In practice, the software built on top of such a blockchain could instantly send alerts to drivers or make direct changes to refrigeration units when certain temperature thresholds are recorded. That workflow would be a significant step up from the status quo, one that would reduce spoilage and the related risks to public health. For organizations to justify the ROI and business case or IoT deployments, they are turning to examples such as these. Between spoiled goods and cost of audit, hundreds of millions of dollars would be wasted every year – and/or create a liability issues if these violations aren’t captured in time. As an experienced partner for SCM solutions, integrated supply chains and custom software implementations, Inspirage is prepared to help clients navigate the next steps in the evolution of cold chain. Visit our resource center or contact our team today lo learn more about how we can help. This entry was posted in Cloud, Life Sciences and tagged cold chain, IoT, Oracle IoT. Bookmark the permalink. Navneet Goel is a Managing Partner and Executive Vice President of Inspirage. He is responsible for managing and growing the Value Chain Practice. Navneet is a leading expert in the field of supply chain management with experience in design, development, implementation, and support of large-scale global supply chain solutions for Global Fortune 500 firms in various SCM areas.